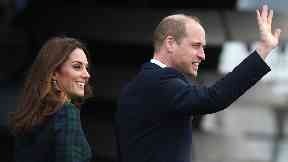 The Duke and Duchess of Cambridge have officially opened the V&A Dundee museum. William and Kate marked the opening by unveiling a carved wooden panel which will be displayed in the entrance foyer. They met its architect Kengo Kuma, local designers, schoolchildren and young people who have worked with the venue. 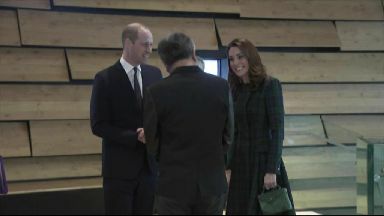 The royal couple also toured the £80m museum's permanent Scottish Design Galleries, and visited Charles Rennie Mackintosh's Oak Room, which was originally opened in Glasgow in 1908. 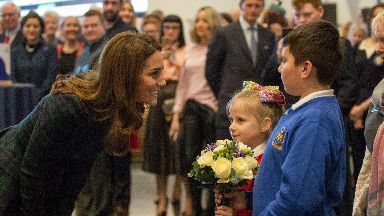 Kate said: "I have been amazed by the breathtaking architecture and the sheer range of design on display. "Most of all, I've been moved by the passion of the people who work here and the dedication of all those who have helped make this important project succeed." She said everyone involved deserved "enormous credit". "The duchess added: "I hope that this museum will serve as an inspiration to others, showing how great things can be achieved when different communities all pull together. "With this thought in mind, I'm pleased to declare V&A Dundee officially open." V&A Dundee opened to the public in September as Scots rockers Primal Scream headlined a festival in the city's Slessor Gardens. Philip Long, director of V&A Dundee, said: "V&A Dundee is an ambitious new international museum, and we are honoured that the Duke and Duchess of Cambridge today declared the museum officially open. "V&A Dundee is at the heart of Dundee's transforming waterfront, and is a key part of the city's plans for an exciting future. "Within our remarkable building, designed by Kengo Kuma, we are proud to host world-class permanent galleries and remarkable exhibitions that have already delighted and inspired hundreds of thousands of people." "This magnificent building is continuing to raise the city's global profile and celebrates Scotland's rich cultural heritage."